In the city of Wheeling, WV there is the small, unassuming WesBanco Arena. Nothing grand or spectacular nestled on the banks of the Ohio River. What you may not know is, come September every year, the city comes alive with anticipation. There is a buzz in the air that can be felt up and down Market Street and across the bridge to Wheeling Island Casino. 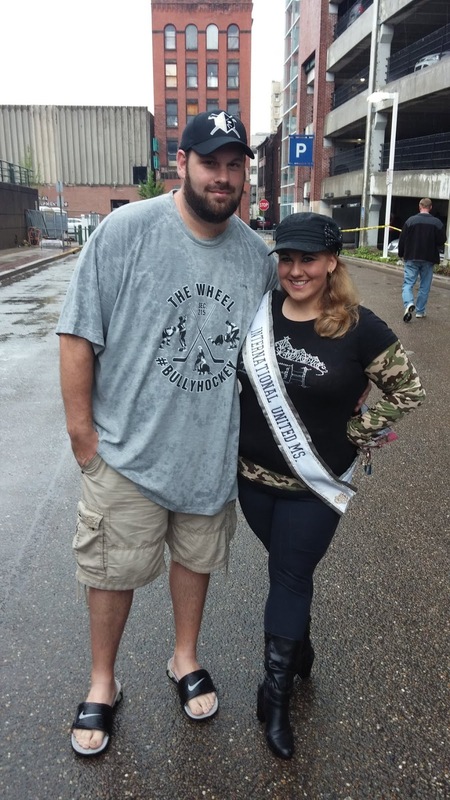 It is a buzz of what many others fans take for granted or plain forget, getting lost in the shadow of the “the big show”. This is the energy of small town hockey. The East Coast Hockey League (ECHL). The mid-level professional hockey league a step below the American Hockey League (AHL). This is where hockey isn’t played for the big time contracts and sponsors. This is where championship runs are fueled by passion for the game and a glimmer of hope to maybe make it, at most, to the AHL. WesBanco Arena is home to the Wheeling Nailers, the ECHL affiliate to our Pittsburgh Penguins. You would not believe how many Penguins fans have no idea there is a team down here that sports a Penguins patch on their shoulder. They even wear the (former) team colors of Vegas Gold and Black. For the most part, the only time the Nailers are even mentioned is when a Baby Penguin (Wilkes Barre-Scranton Penguins) gets sent there or they have to call a player up to fill a spot (which happened a lot this past season). I am telling you now; this team is worth mentioning and remembering. It is probably some of the best hard-nosed hockey you could ever want to. They play with a fire and spirit that is, by all accounts, inspiring. You will also witness some of the worst officiating on ice that make the normal NHL refs look competent, but I digress. The men on the ice play for the game. Most of these players know that this may as far as they will ever get and, for the most part, seem just fine with that reality. As long as they are playing, that is all that matters. They also stay connected to their fans. The team offers many opportunities throughout the season to skate and interact one-on-one with the players. You may even catch a Nailer, like Clark Seymour or Ty Loney, ringing you out at the local McDonalds or serving you a drink at the nearby Quaker Steak as part of a promotion. Grounded, humble and appreciative are these men of their fans who come cheer them on every game. The Nailer fan base is electric. I have never seen an entire town more amped up after a win than I saw this past weekend when I traveled down to watch a thrilling victory over the Reading Royals (the Philadelphia Flyers affiliate team, how appropriate). People hanging out of cars, blowing their horns, making an all-out racket up and down the streets for blocks. Then again this was no ordinary win. 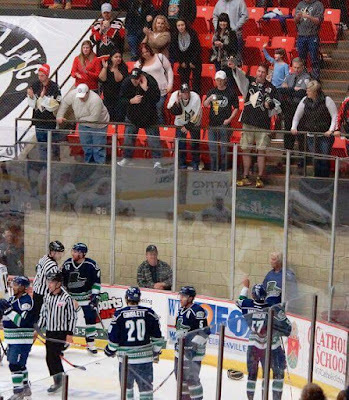 This was a Game 7, 30-seconds left on the clock over-time win to advance to the Eastern Conference Finals of the ECHL Kelly Cup playoffs. I had a chance to talk to a few of the Nailer faithful to get a sense of what professional hockey means down here. JH: “This team has overcome so much adversity, on and off the ice. Three head coaches in one season, yet still making the playoffs. It is a credit to the guys in the dressing room. So much character, heart and personality here. Guys play for one another and they play for us…the fans. They want to win a championship for this city. Talking to Jim, you can feel the love that this city has for a team that has battled the odds like their own version of the Hunger Games. Jim, however, credited a lot of the “good things” happening lately PR wise to local personality DJ Abisalih. I posed the same questions to him and had some amazing things to say about not only the team, but about how the town has grown and begun to thrive again when they welcomed professional hockey. “The Nailers have been a big part of the city's evolution, as the arena received an enormous renovation, new businesses have been added to downtown, and apartment buildings where the players stay have been put in, which all ultimately helps the city bring in more jobs and more money. Wheeling is a blue collar community and they like a team that fits that mold - a group of players who are going to work hard for literally everything they get. Being from a small town myself, seeing the way a community can rally around one team with such gusto is something I can relate to greatly. A blue-collar working class, people up and down on their luck, a team like this gives a town and its people hope. It gives them something to take their mind off their own lives, even if it is just for a short time. Currently, the Nailers have a tied-up Eastern Conference Championship series with the South Carolina Stingrays, winning their last game in dramatic fashion, in double overtime (this seems to be a trend). I enjoyed watching this team play on my visit and I look forward to making more trips down to “The Wheel” this season and in the future. 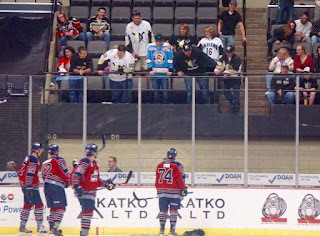 The Wheeling Nailers deserve more love than what they are getting, especially from a fan base as large as the Penguins. It is not a far drive. The ticket prices are great and the promotions they offer throughout the season are terrific. Not to mention it’s only an hour from Pittsburgh. If you want to feel like you are in a modern-edition of the movie “SlapShot”, this is the place for you. How many fans make that same trip every year to Ogleby Resort to see Christmas Lights? Why not make the same trip and support a team that could hold the next star winger or defensemen for our “big boys” at Consol Energy Center? I can 100% certainly say I am a fan. I guess Wheeling (their fans and the players) will just have to get used to the loud-mouthed blonde from Pittsburgh from now on and I hope more of my fellow Pens fans will join me. 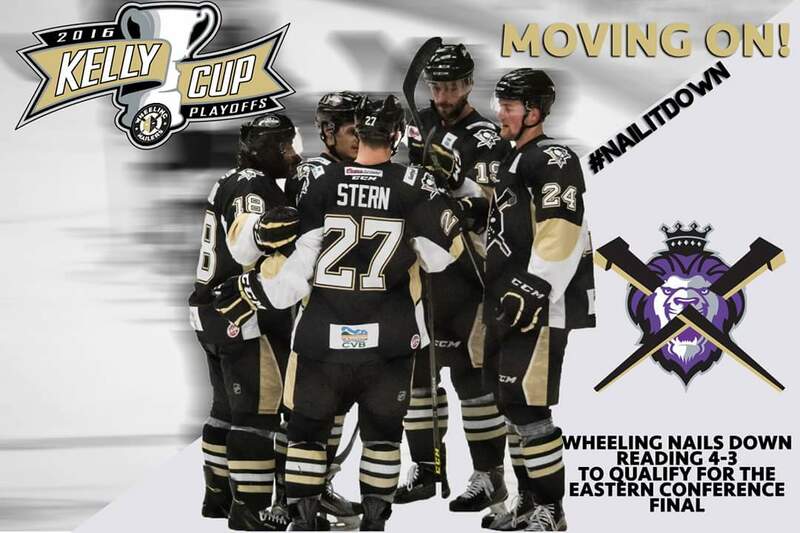 Great article that should open up a lot of people's eyes about the Nailers ! I loved the article. I moved from Wheeling (Originally from Pittsburgh by the way) three years ago to Florida and yet I make 5 games a year. Once a big Penguin fan, I'm now a Nailers fan and a fan of Wheeling. 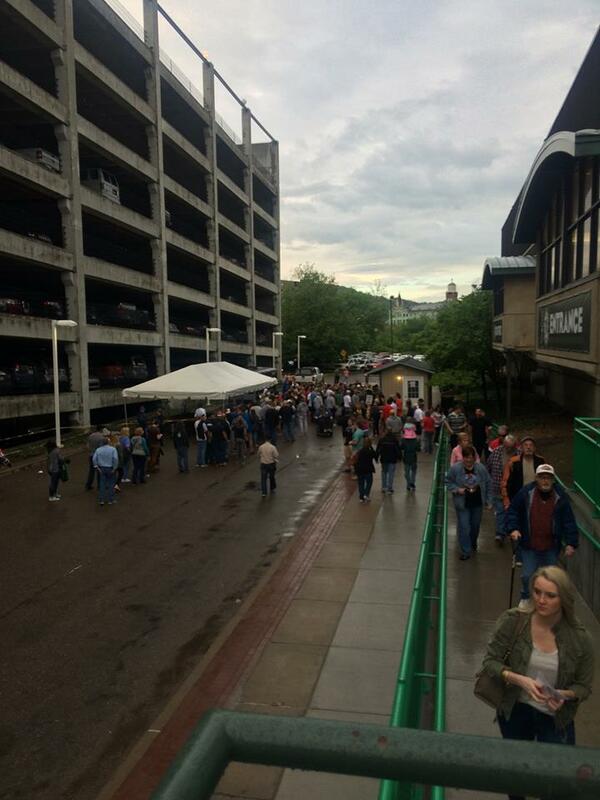 Thank you for this fine article and lets hope it draws some Pittsburgh fans to Wheeling. It's worth it. Well I guess I have no choice but to come down Saturday night now. See you all then. Wow guys, I am so glad you enjoyed the article. Thank you so much for all the positive feedback.